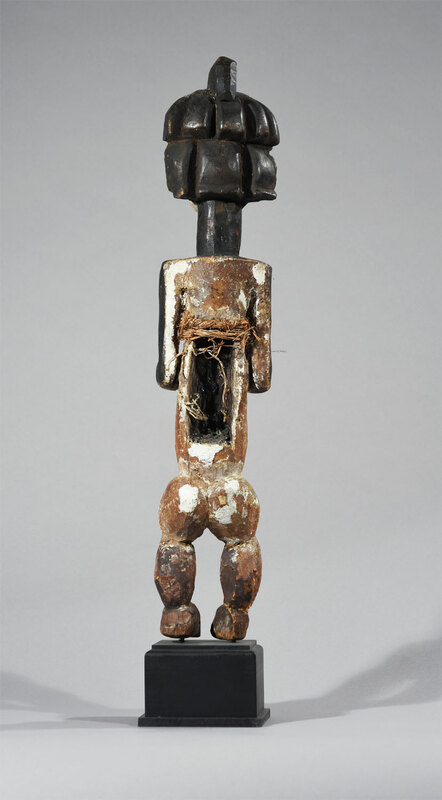 Mbete sculptors developed a figurative reliquary form that fully integrated ancestral sacra within the sculpture. In this tradition, a hollowed columnar torso served as an internal receptacle. The core is framed by the gesture of minimally defined arms held to either side and supported below by knees, which bent above broad muscular calves. 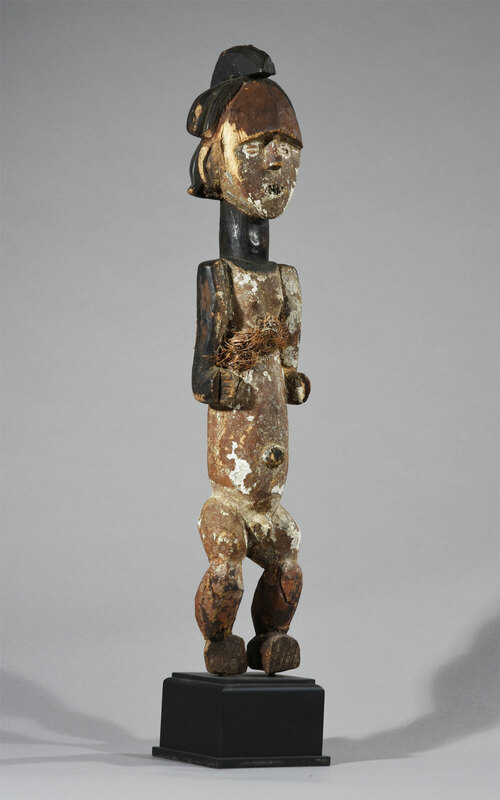 The tense posture of the figures suggests their role as active guardians to the reliquaries’ contents. Access to the contents was afforded through the backside of the figure, where a long rectangular panel is featured that serves as the aperture to the hollow interior of the torso. 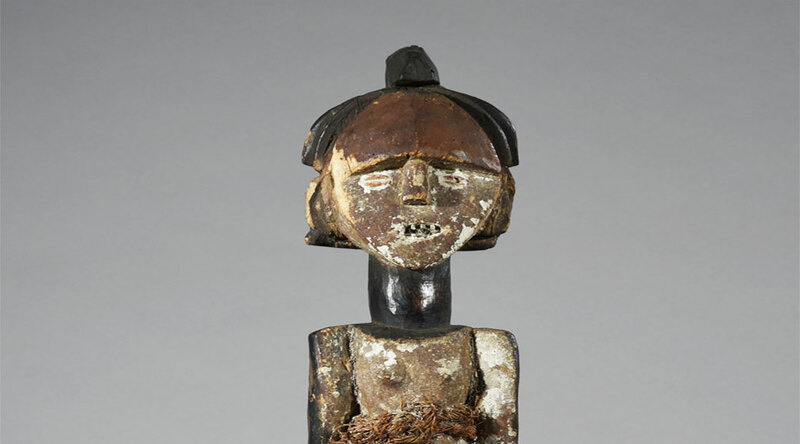 This intensely concentrated figure evokes an active sentinel. The suggestion of arrested movement derives from the slight torsion of the lower body. There is also a very slight asymmetry to the placement of the hands on either side of the stomach. Seen frontally, the body appears much narrower than it actually is; its full breath is apparent in profile. An alternation of black, white, and red applied pigments established at the summit with the coiffure, forehead, and face is repeated on the neck, trunk, thighs, and calves. Especially thick applications of white kaolin have survived. The relative flatness of the visage contrasts with the volumetric form of the head. A prominent raised sagittal crest is flanked by lateral tresses carved as a series of deeply incised parallel lines. 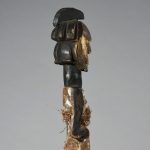 The smooth crescent of the forehead projects slightly above the lower half of the face that is enlivened by additions of cowry shell eyes and fine metal teeth inserted within the open mouth. 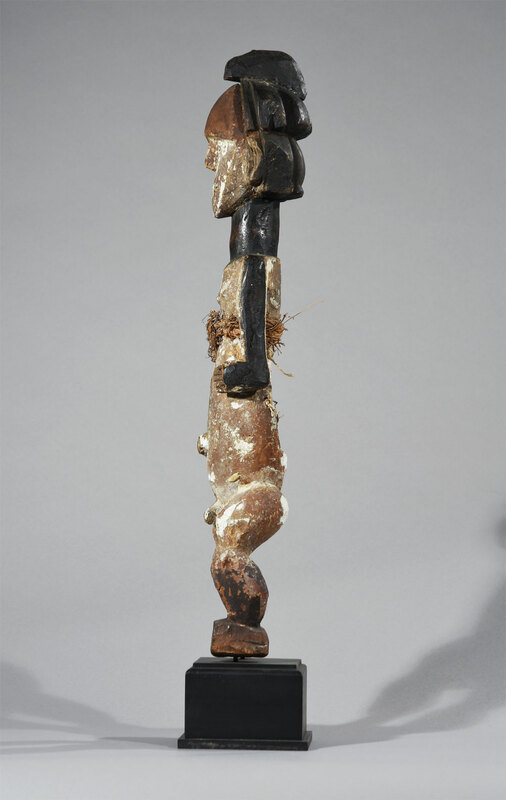 The scheme of black, white, and red pigments applied to the surface of this work and culturally related wood sculptures from the Lower Congo region constitutes a coherent system of color symbolism drawn upon for rites of passage. Black was widely drawn upon in connection with death, burial, and mourning. The ancestral realm is characterized as white, and it is most dominantly manifested in rites relating to vision and heightened awareness such as initiations. Red pomade, a regional cosmetic, was sometimes rubbed on the bodies of the deceased and applied to their insignia to invest them with renewed influence and agency. LaGamma, Alisa. 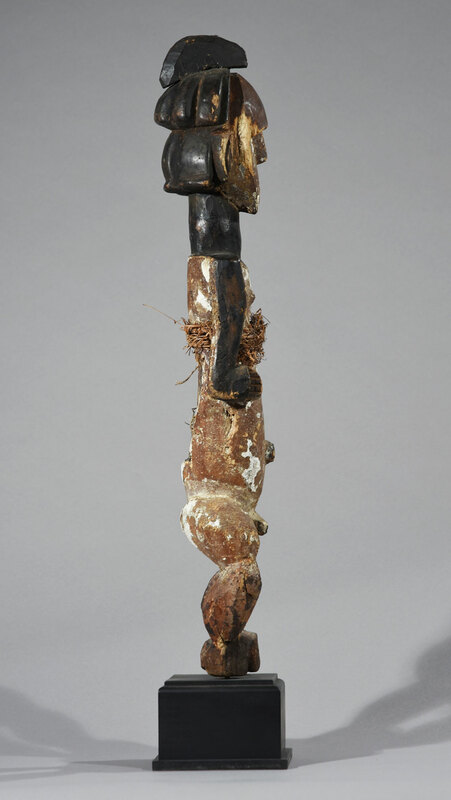 Eternal Ancestors: the Art of the Central African Reliquary. New York: Metropolitan Museum of Art, 2007. Perrois, Louis. 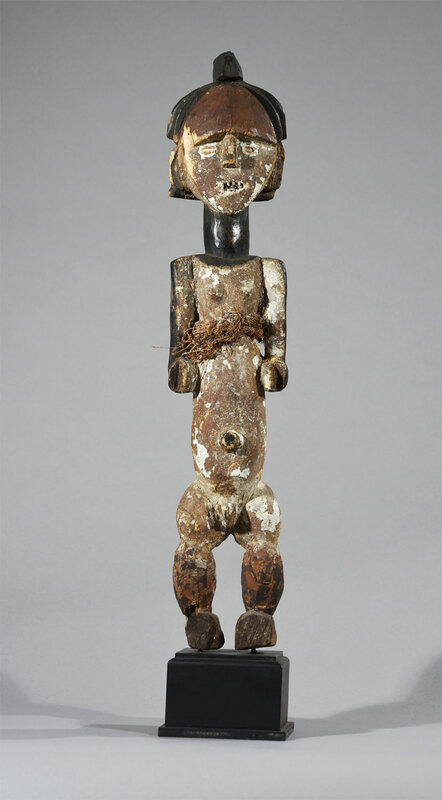 “Ambete Art and the ‘Kota’ Tradition.” Art Tribal, no. 1 (Winter 2002), pp. 74-103.